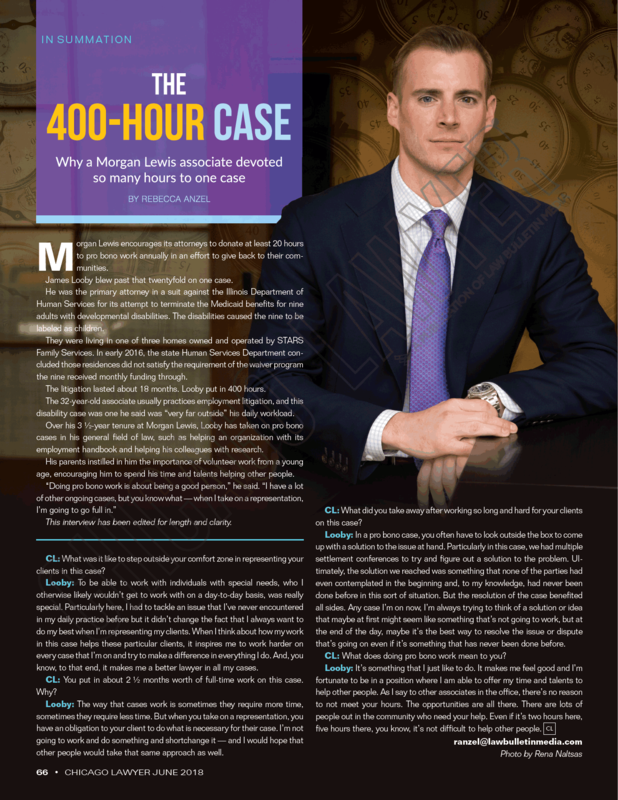 Chicago Lawyer Magazine published this piece in print in June 2018. Morgan Lewis encourages its attorneys to donate at least 20 hours to pro bono work annually in an effort to give back to their communities. James Looby blew past that twentyfold on one case. He was the primary attorney in a suit against the Illinois Department of Human Services for its attempt to terminate the Medicaid benefits for nine adults with developmental disabilities. The disabilities caused the nine to be labeled as children. They were living in one of three homes owned and operated by STARS Family Services. In early 2016, the state Human Services Department concluded those residences did not satisfy the requirement of the waiver program the nine received monthly funding through. The litigation lasted about 18 months. Looby put in 400 hours. The 32-year-old associate usually practices employment litigation, and this disability case was one he said was “very far outside” his daily workload. Over his 3½-year tenure at Morgan Lewis, Looby has taken on pro bono cases in his general field of law, such as helping an organization with its employment handbook and helping his colleagues with research. His parents instilled in him the importance of volunteer work from a young age, encouraging him to spend his time and talents helping other people. Chicago Lawyer: What was it like to step outside your comfort zone in representing your clients in this case? Looby: To be able to work with individuals with special needs, who I otherwise likely wouldn’t get to work with on a day-to-day basis, was really special. Particularly here, I had to tackle an issue that I’ve never encountered in my daily practice before but it didn’t change the fact that I always want to do my best when I’m representing my clients. When I think about how my work in this case helps these particular clients, it inspires me to work harder on every case that I’m on and try to make a difference in everything I do. And, you know, to that end, it makes me a better lawyer in all my cases. CL: You put in about 2½ months worth of full-time work on this case. Why? Looby: The way that cases work is sometimes they require more time, sometimes they require less time. But when you take on a representation, you have an obligation to your client to do what is necessary for their case. I’m not going to work and do something and shortchange it — and I would hope that other people would take that same approach as well. CL: What did you take away after working so long and hard for your clients on this case? Looby: In a pro bono case, you often have to look outside the box to come up with a solution to the issue at hand. Particularly in this case, we had multiple settlement conferences to try and figure out a solution to the problem. Ultimately, the solution we reached was something that none of the parties had even contemplated in the beginning and, to my knowledge, had never been done before in this sort of situation. But the resolution of the case benefited all sides. Any case I’m on now, I’m always trying to think of a solution or idea that maybe at first might seem like something that’s not going to work, but at the end of the day, maybe it’s the best way to resolve the issue or dispute that’s going on even if it’s something that has never been done before. CL: What does doing pro bono work mean to you? Looby: It’s something that I just like to do. It makes me feel good and I’m fortunate to be in a position where I am able to offer my time and talents to help other people. As I say to other associates in the office, there’s no reason to not meet your hours. The opportunities are all there. There are lots of people out in the community who need your help. Even if it’s two hours here, five hours there, you know, it’s not difficult to help other people.